We Won! Jay Leno Cancels Appearance at Gun Industry Trade Show | Join the coalition that struggles against the gun holdings. 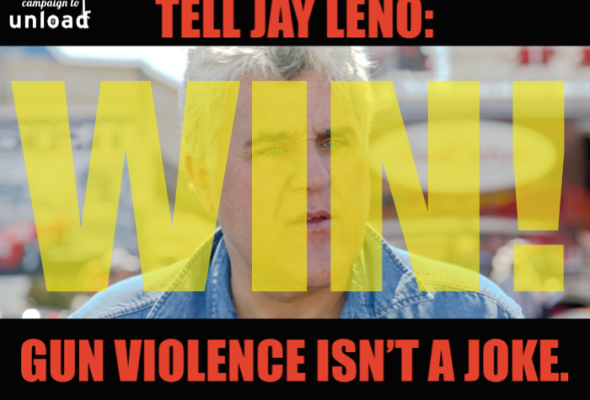 A brief campaign by three gun violence prevention groups — Campaign to Unload, Newtown Action Alliance, and Coalition to Stop Gun Violence — succeeded in convincing Mark Twain Award-winning comedian Jay Leno to pull out of a planned performance at the gun industry’s largest trade show. Congratulations to all the activists who pressured Mr. Leno via our petition and social media. Your voices were heard! Campaign to Unload’s statement: “I’m grateful that Jay has seen the NSSF for what it really is: a corporate lobbying group that puts money over morality, no matter how many families are destroyed by its products,” said executive director Jennifer Fiore.